All photos in this post, with the exception of the first one, are by Angus Kennedy. The recent #fieldworkfail Twitter fad reminded me of something I heard back in January. I was attending a careers workshop at an academic conference and they had a panel of people who conduct job interviews giving advice to us future job seekers. One panellist shared one of her favourite interview questions, which I don't remember verbatim but went something along the lines of "Describe an incident where something went wrong during your fieldwork and how you dealt with it." This is a very fun question because many things go wrong in the field, and the solutions can come from anywhere. 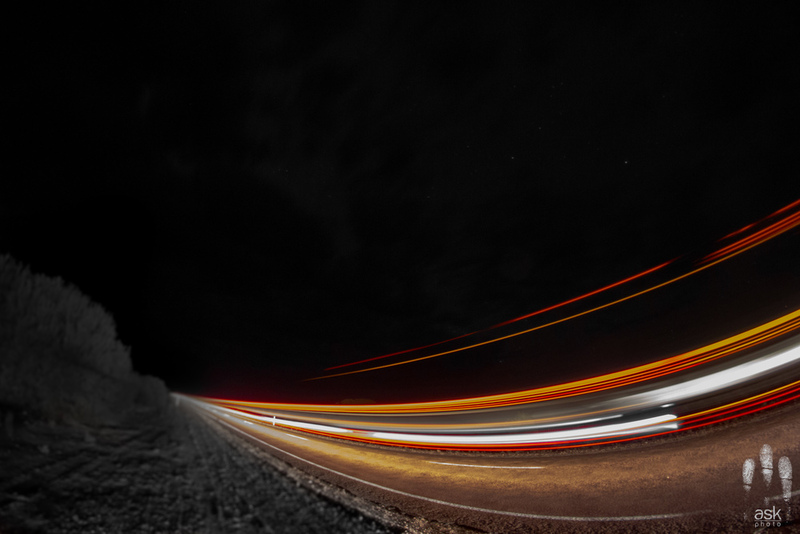 Often times, when something goes wrong in the field, there's no one there to tell you how to fix your problem, and you learn just how resourceful you can be when push comes to shove. I thought I'd share the biggest catastrophe that happened to me during fieldwork and how we dealt with it, to pre-empt any future interviewers and because Angus got some excellent pictures of the disaster in progress. For the first two years of my fieldwork, we had a little blue trailer that we towed behind our Landcruiser. It was kindly loaned to us by a professor in the Plant Sciences department at ANU. This is the story of how I managed to destroy it. Or, if I'm feeling charitable to myself, how it managed to destroy itself despite my best intentions. Our beloved, but ultimately doomed little blue trailer. Photo taken during this other catastrophe. The Landcruiser is a great fieldwork vehicle for many reasons, but trunk space is not one of them. While in the field I always had up to three volunteers with me, and four people in the Landcruiser leaves little room for storage (and the more people, the more stuff there is that needs to be stored). Our beloved little blue trailer was very useful in transporting all the stuff that comes along with moving a bunch of people through remote areas. Everyone has their own massive backpack filled with personal stuff, their own tent or swag for sleeping, plus we needed to move massive amounts of food and water, a kitchenette with which to prepare meals and eat them, and a propane tank to run the camping stove. Really, the amount of stuff we needed to haul around with us to keep ourselves alive far exceeded the amount of stuff we needed to haul around to do the fieldwork. And that's why we needed that little blue trailer. At each field site our field camp came tumbling out of the little blue trailer. The trailer successfully survived my first field season without any major problems. Sure, it needed some repairs when we got back, mostly to the electrical wiring and peripherals, but it survived intact and without any hint of major structural problems. However, my second field season was another story. Before we left, we took the trailer to get a check-up and it turned out the axle bearings needed to be replaced, and so they were. However, a month into our fieldwork the owner of the station we were working at noticed that the grease caps had come off the trailer. The grease caps protect the ends of the axles, preventing stuff from getting onto the bearings inside. Where we do fieldwork the roads are all dirt, and there is a lot of dust. I took the trailer into Alice Springs right away, but it was too late. Dust had gotten into the axles and the bearings had to be replaced AGAIN. They also put new grease caps on. I was assured that grease caps rarely have to be replaced, and that the trailer would now be fine. In the Outback everything gets covered in red dust. In addition to axle bearings this includes the inside of vehicles (left) and my face (right). However, not two days later, and after only travelling on paved roads, I notice that the grease caps had once again come off. I thought they must have been put on incorrectly in Alice Springs. We were in Yulara, which luckily has a mechanic's shop despite being not much more than a tourist resort. I got them to put new grease caps on the trailer, asked them put them on "extra tight" and I also asked to buy all the shop's extra grease caps. They looked at me weird when I said I wanted to buy all of their caps, and assured me that grease caps don't just come off and that the trailer would be fine. I bought all their grease caps anyway. That night driving south I noticed that the grease caps were already starting to come loose. 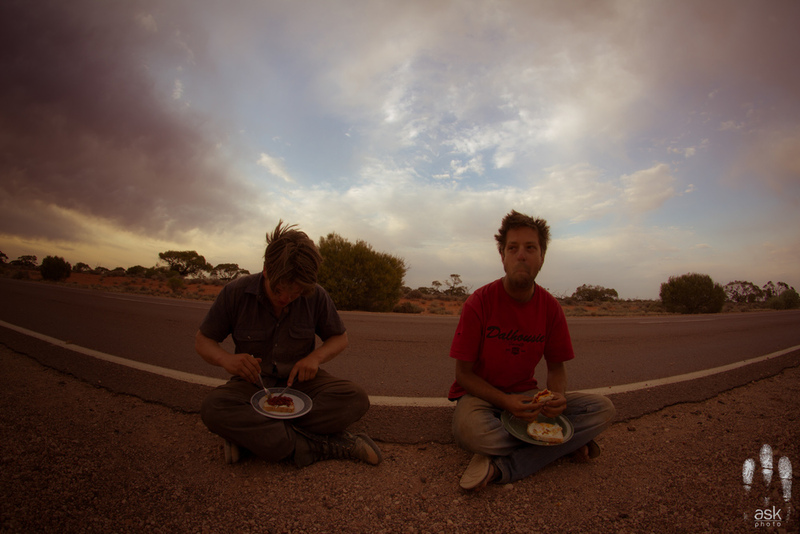 I tried my best to bang them back into place, but by the time we got to Coober Pedy the next day they were gone. At the mechanic's shop in Coober Pedy they cleaned and lubricated the bearings and affixed two more of my grease caps to the axels. By this time I knew the caps wouldn't stay on. 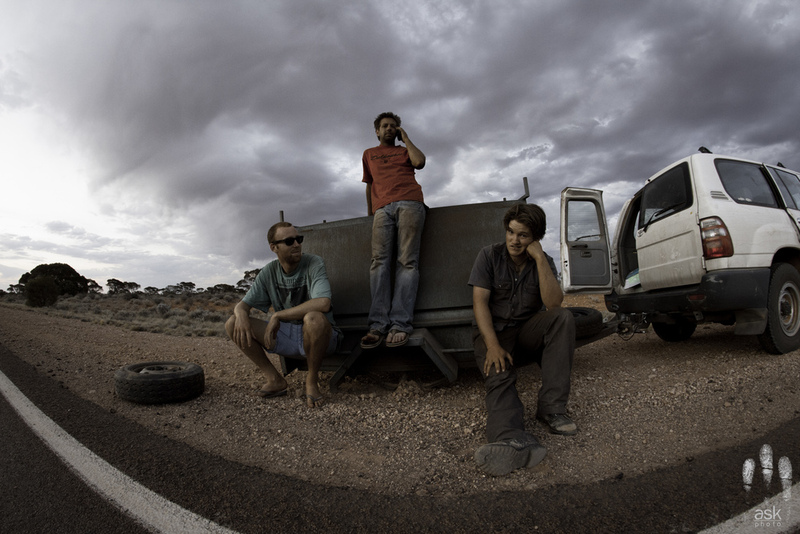 I just wanted to get to Port Augusta, where we could leave the trailer in storage and continue our fieldwork without it. Unfortunately, less than 80km south of Glendambo and only 200km for Port Augusta, the trailer came apart. The trailer's right wheel came completely off the axel and flew off into the bush. My volunteers Angus and Mitch later recovered it, apparently 50m off the road! The axel dug into the Stuart Highway, taking a decent-sized gouge out of the road and shooting up an impressive display of sparks while I tried to slow down and pull over as quickly and safely as possible. When I went back to inspect the trailer the remaining wheel had smoke coming out of the axel, and no grease cap in sight. The next hour or so was quite demoralising. I had to use the satellite phone to call up my supervisor and the department's fieldwork coordinator to report what had happened. We were essentially stranded. It's illegal to abandon vehicles and equipment by the side of the road in Australia, and punishments are severe (abandoning vehicles in the Outback, usually after covering them in gasoline and lighting them on fire, is something of a shameful tradition in Australia). A call to our insurance provider, the NRMA, confirmed what I suspected: only the Landcruiser was insured, not the trailer, so they weren't coming to get us. The cops came by to check out the situation but weren't about to volunteer to transport our disabled trailer anywhere. Without any other options, I left Angus and Mitch to watch over the trailer and I drove back to Glendambo. My run of bad luck continued, the only guy in Glendambo with a flatbed truck was out of town for the week. 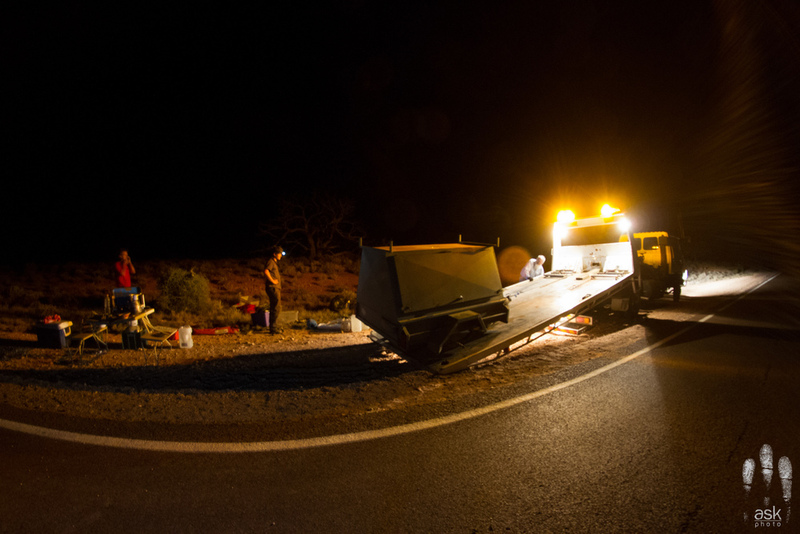 However, I noticed a flatbed parked at the Glendambo roadhouse with a wrecked car as cargo. I went into the petrol station and found the driver: an old, grizzled, significantly bearded guy who looked like he'd been driving outback roads since coming back from serving in the second world war, eating a standard roadhouse meal and watching TV. I tried to ask him if he'd help, but he took one look at me and told me to wait until he was done his dinner. An awkward silence ensued. Finally, after he finished, he explained how much of a hassle it would be to offload his current cargo, drive all that way, and how much behind schedule it would put him. I thought he was going to refuse, but it turned out he was just trying to soften me up for how much he wanted to get paid: $200 cash. Given the circumstances, he could have charged a lot more, and I was happy to hand it over*. The truck driver off-loaded his wrecked car and followed me back down the Stuart Highway to the wrecked trailer. He loaded up the trailer, which looked sad and small lopsided on the huge flatbed, and drove off. 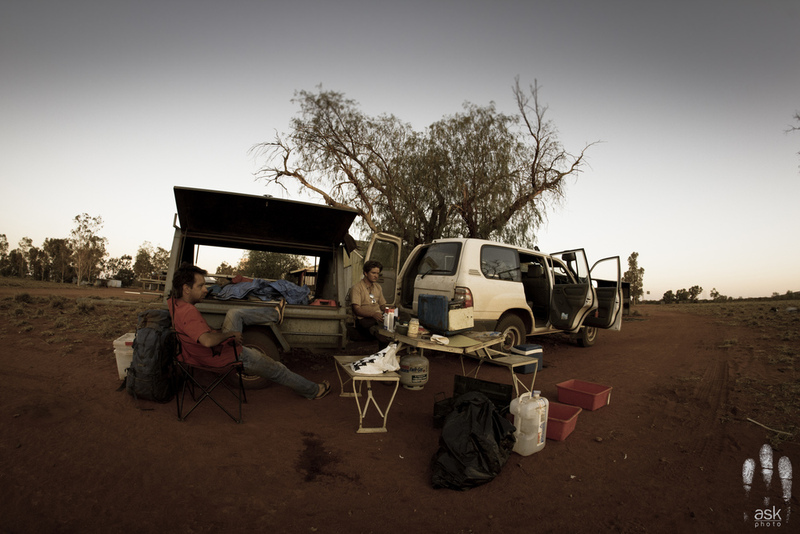 By this time it was about 11pm, and we set up camp on the side of the Stuart Highway. The next morning Angus, the best chef of the three of us, cooked breakfast, which we ate sitting on the highway, getting up for the occasional car or truck zooming past. The Stuart Highway is so straight and flat that there's plenty of warning whenever anyone's approaching, even at 110km/h. We packed everything into the Landcruiser, an extremely tight squeeze. If I remember right, we ended up with the propane tank on the floor where the front passenger's feet should go, which did not seem very safe to me. There was absolutely no room in the back, so all three of us had to sit in the front, with Mitch sitting in the middle, crotch-to-gearshift**. 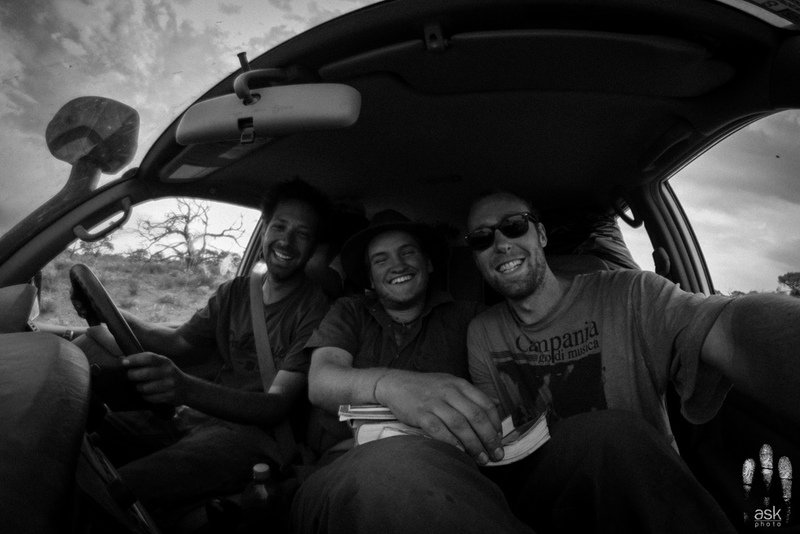 We got to Glendambo and were able to throw out enough non-essential stuff to clear space for one person to squeeze into one of the middle seats, though whichever unlucky person sat there was jabbed in the back by lizard-catching rods for the entire ride. The truck driver said he was going to dispose of our trailer at the Glendambo dump. When we got to our next field site, a sheep station near Lake Everard, and we explained what had happened, the station manager's eyes immediately lit up. All that had happened was one wheel came off? The missing wheel was inside the trailer? The axle was only bent, not broken***? He called up one of his mates to recover the thing from the dump, apparently it was recoverable enough to be useful pottering around the station. I never did hear whether they were able to find it at the dump, or whether it ever became useful again. This disaster left me with two questions. The first is why did the grease caps keep coming off? While I don't really understand why they kept coming off when I was told repeatedly they very rarely come off, there was evidently some structural abnormality with the trailer that made it easy for the caps to come off. When we took the trailer in for a check-up prior to my second field season, the mechanic pointed out steel plates attached to the wheels. He said he'd never seen anything like them before. He also said they were not properly secured to the wheels and therefore liable to come off unexpectedly, and possibly on the highway, making them quite dangerous. He recommended, and we agreed, to remove them. I now think that these plates were holding the grease caps in place. Two pictures of the same trailer wheel. The left photo, taken during my first field season, shows the steel plate bolted over the grease cap. The right photo, taken during my second field season, shows that the steel plate has been removed and the grease cap is exposed. My second question is why did the wheel come off on the highway? It doesn't seem evident to me that the wheel coming off is directly related to the grease cap problem. 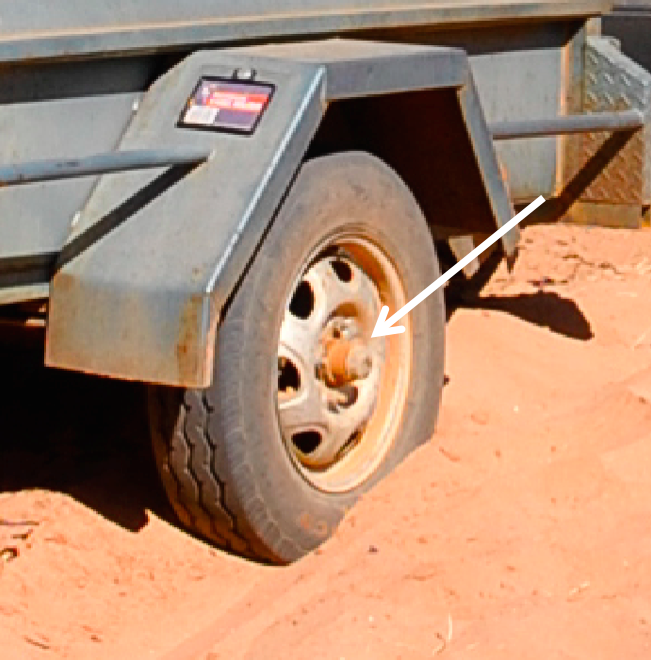 The wheel came off less than a week after the bearings were replaced in Alice Springs and within that week three separate mechanics had looked at the trailer and deemed it roadworthy. Less than 12 hours before the wheel came off the mechanic in Coober Pedy had cleaned and lubricated the bearings. I genuinely have no idea why the wheel came off. If you have any idea, please let me know. Campfire with the trailer during happier times. *Normally expenses during fieldwork get reimbursed, but there was never going to be any sort of receipt or official documentation of this expense. The $200 was my personal penance for the trailer destruction. **There is actually a seat there, I assume meant for children. ***Though I didn't look, the axle was likely bent when it dug into the Stuart Highway going 110km/h.